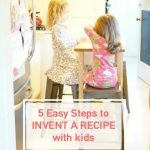 After sharing some thoughts yesterday on how to invent a recipes with kids (by opening your kitchen up as a lab for experimentation), I thought it might help if I backed up a bit and shared a few tricks that have helped me set the stage for kitchen experimentation. Spend time in the kitchen. I’m a big advocate for bringing children into the kitchen at an early age. Babies won’t do much in the kitchen, obviously, but the kitchen is full of sensory experiences that can grab hold of the attention. As soon as my kids could stand, they’ve been active observers; watching me chop, stir, mix, and pour. Give them tools. And as soon as they show an interest, I give my kids small bowls to mix pretend batters and salads while I make the real thing right next to them. My youngest is 18 months old, and she loves mixing just about anything. She’s not as efficient as I am, and she’s certainly not as neat, but I know that if I include her at this young age she’ll feel comfortable in the kitchen as she grows older. Find some kid-friendly knives. Did you see that my toddler is wielding a knife? 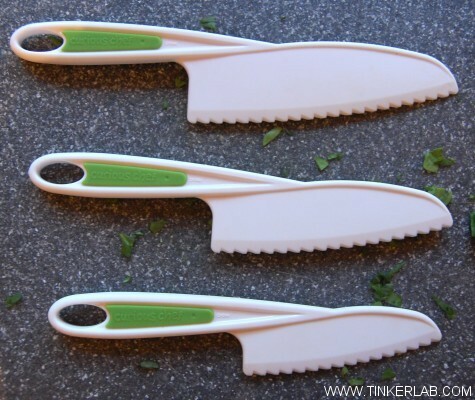 One of my most creative friends, Rebecca Jordan-Glum (she’s just building her Facebook page — visit her here: turned me on to these incredible kid-friendly knives from Curious Chef. We bought this pack of 3 knives for under $10, and use them all the time. If they’re out of stock, you can also find the knives through other Curious Chef cooking packages. My 3.5 year old knows where to find them and can help herself, and my 18 month old will ask for “knife.” My youngest doesn’t use the knife as its intended, but she wants to join the party and I’m not going to stop her. The knives are appropriate for children ages 5 and up, so supervision is recommended for little ones. Involve them in simple cooking projects. When I’m having a long day and I’m not in the mood for a massive clean up, I’ll try to find neater cooking projects for my kids to help with. Chopping salad is one of these projects. Scooping flour is not. Spreading butter on toast is one of these projects. Making pancakes is not. Cooking with My Kid is a beautiful site, full of practical ideas. Macki describes herself as a “Foodie by day, microwaver by night, I set out to teach my kid (and myself) the art of cooking.” I’m kicking myself because she was at Blissdom, and we didn’t meet! Do you like to cook with your kids? 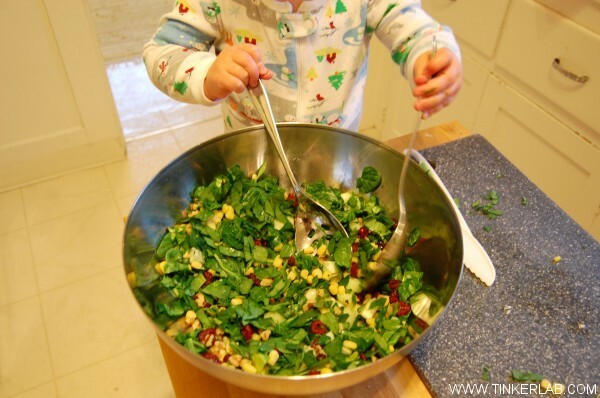 What are you favorite cooking-with-kids tips? 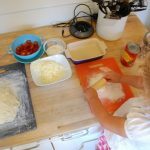 What is the most challenging part of cooking with children? Do you have a favorite “neat” cooking project? Note: I share affiliate links for products I adore or think you’ll find useful. 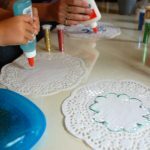 If you purchase through those links I will receive a small percentage of the sale; thanks for your help keeping this blog running! I love cooking with my toddler. I find vegetable washing to be a huge hit. I also let him prepare his own breakfast by spreading the jam or pouring the milk or slicing his banana, he loves it and it gives me a chance to make my coffee. Ooooh, vegetable washing. That’s a good one. How do you set this up? At the sink or in a little tub? And what a sane and calm way to begin your day. Thanks for sharing your ideas with us. I have a colander that stretches across the sink, he stands on a chair and gets to spray like crazy. He has even learned how to strip chard! There are always a few bites missing from the carrots which pleases me very much. That would please me, too! And stripping chard…I could learn a lot from you! Thanks for sharing the link. I’ll check it out! Good idea, Heather! Thanks for sharing this with us. Now I want to go crack some eggs! One kitchen tool worth the investment is a non electric hand mixer to help beat up all kinds of concoctions. We love that wooden fruit cutting set too. So clever! You know, Melissa, I’ve had a hand-held mixer on my list for the longest time, and when I finally spotted one recently I was shocked at how much it cost. I’ll have to do a more thorough search because I think you’re absolutely right — they are super fun tools for kids. Oh, how we love to eat guacamole. It must be a California thing. So Eiya does all the mixing with her bare hands?! You are one brave mama, and I can see why she’d love that. Mmmmm. 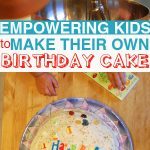 I’m a preschool teacher and when I allow kids to really cook–to mix and pour and chop and roll–and each make their own creation, like a muffin, or cut up fruit, etc.–I prepare a tray of them to bake off ahead of time so the snack is sanitary. Kids being, well, kids. 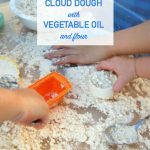 I learned this after one of my students sneezed out a big–well, use your imagination–all over our pasta dough. I have been wanting to include my 22 month old more, and this post is some of the fuel I needed. Thanks! Sweet! I’m so glad to read that this inspired you, Krista! Please report back if you have a chance. And have fun! My almost two year old loves to roll out dough. Whenever I’m making bread or tortillas, she gets a little ball of it and gets to play with it. My husband very bravely also lets her crack eggs. There’s a separate bowl for her to crack them in, and she still drops the shell in too, but then he fishes it out. She absolutely loves it! 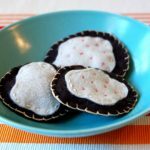 Do you have one of those fab tortilla presses too? If not, my daughter first used one at the play dough station at her preschool, at around age 2, and loved it. I wish she was more brave with eggs, but she’s not into getting goopy things on her hands…something to work on! Thanks for the great tips! Of course, with the volume of scraps that heap onto my flour, dogs would be in big trouble (or quite content) in my kitchen! And I agree with you on pizza — almost anything goes. It’s one of our favorite collaborative meals too. Now that they’re older, both girls help me in the kitchen. My 4-1/2-year-old is already learning how to safely use a knife (she’s only allowed a butter knife). She loves to stir, whisk, roll out dough, etc. She’s becoming quite a pro at pizza dough! I’m going to have to check out the knives you posted… those look awesome! Right! It’s never too early to bring kids into the kitchen, and for all the points you raised. 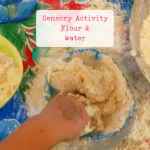 The sensory experiences are so rich. Scooping, feeling rice in the fingers, squishing bananas. It’s all wonderful and builds a familiarity with the kitchen from the beginning. I would be thrilled if my kids could take over pizza dough making! Thanks for the nice comment, Terri! Great idea! Loved the kid-friendly knives. Aren’t they cool? I was so grateful to learn about them, and my kids now ask to chop along with me all the time. I am going to HAVE to get some of those knives! 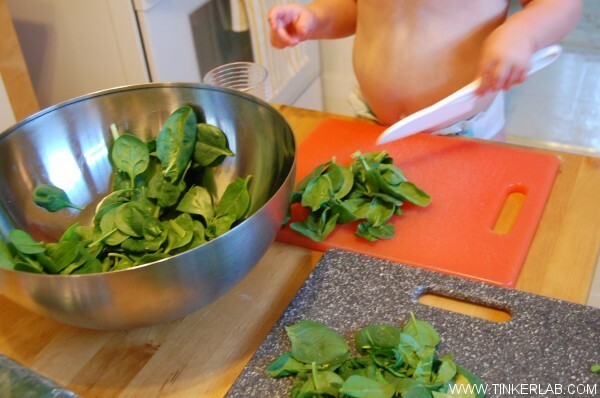 We love making homemade pizza together, which also encourages the tot to try new things – even spinach! I think it’s so important for kids to feel confident in the kitchen and learn more about where their tasty foods come from. Thanks for the tip about the knives! no problem 🙂 my kids like butter knives too, for spreading and softer foods like avocado and butter. That’s a great tip, Heather. Lucky you to find them there. Strawberries are the perfect thing to cut with these knives. In fact, N was cutting strawberries and peaches with hers this morning! Those knives are awesome! I think that may be something to look into for us. Thanks for the idea and the link! I love to cook with my son. He washes the produce. I put a bowl of produce on the counter and a colander in the sink (after I disinfect the sink in case he misses or drops them. He pulls up a chair so he can reach.). He also gets to help me put the extra stuff in, like cut up (I cut them) potatoes and carrots in the crock pot with the roast or other veggies in the pan with whatever meat we’re having, pour the bullion/spices or sprinkle the seasoning over it all and put the lid on. When we bake, I measure and he pours the ingredients in the mixing bowl and helps to mix and stir. He LOVES when we use the stand mixer. Sometimes, he gets ahead of me and mixes the wets with the drys too soon, but so far, it hasn’t caused any major problems. If I’m cooking for a friend or event where it needs to look nice, I’ll do it after he’s in bed. 🙂 He gets to put the “toothpicker” in the muffins or cake too, to make sure they’re done, supervised and being careful not to burn himself on the pan of course. Tonight, he’ll help me tear the lettuce for tacos and set the silverware and napkins on the table. So many good tips! Do you mind sharing the recipe for the salad you guys are working on in the photos above? My son is a bit younger than his friends, and they are all having their second birthdays. I am not exaggerating when I say that every single one of them got a play kitchen for their 2nd birthday. That’s great, I guess, but I don’t see the need for it, as my son just helps me in the real kitchen, and I love that! He does very simple things now, mostly pouring, or helping stir, but its better than throwing plastic food all over my living room. The sensory and learning experiences just aren’t the same when you’re playing with fake food! One of my favorite things to use with my children in the kitchen is the Learning Tower. (http://www.mylearningtower.com/) It’s this little platform that safely brings young kids up to the same level as you so they can see what you’re doing and work along side you. I often make Banana Bread (or muffins) with my 3.5 yr old and she LOVE LOVE LOVE’s it. I let her mash up the bananas, sometimes with a spoon and other times with her hands (if I’m feeling ok with cleaning up a mess that day LOL). Then I go about measuring out each ingredient, I let her dump it in the bowl and stir it up (I go behind at the end and give it some stronger stirring, of course), and then once it’s in the pan I let her help carry it over to the oven. She feels like she made the bread (and essentially she did) and is SO proud of herself for it. We have a loaf in the oven right now actually, LOL. Hi Leigh, I can almost smell your banana bread! I’m so glad that you shared your experience with cooking with your child, and I love the bit about mashing up the banana with bare hands. I can’t believe that I’ve never encouraged that! I go through essentially the same process with my kids and they will fight over who gets to pour the ingredients into the bowl. We’ve finally figured out a strategy for dividing the work, and I love that they enjoy it so much that it’s more fun than chore. I am a huge advocate of getting kids involved into the kitchens and learning about where there food comes from and what foods are beneficial to them. Your salad looks AMAZING! Would you mind sharing what you put inside? I also LOVE the knives! Such a great idea! I just ordered them! Thanks! I’m just catching up on comments, and this made my day!!! I’m so happy to read this, Amber. Please keep me posted on what works for you as you launch into cooking together. I love this post! My son has been in the kitchen since the age of 2. He’s 6 now and has become a great little chef. 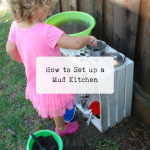 I am a big advocate of getting kids to be leaders in the kitchen and it has to start early. I am going to share this post on our Facebook page. Thanks!